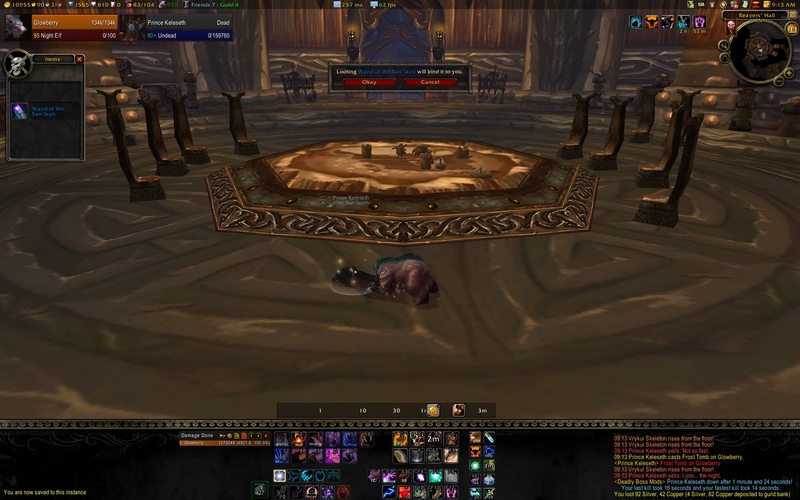 While soloing raids can be great for making a bit of gold, or filling out some of my old-school reputations, there’s no reason to try soloing the wrath heroics except for the heck of it. It’s a list that once I’ve considered, I feel compelled to work through. First heroic on the list: Heroic Utgarde Keep. Why? Well in my mind it was the easiest to burn through as a group. As I discovered, this did not make it necessarily easy to solo. 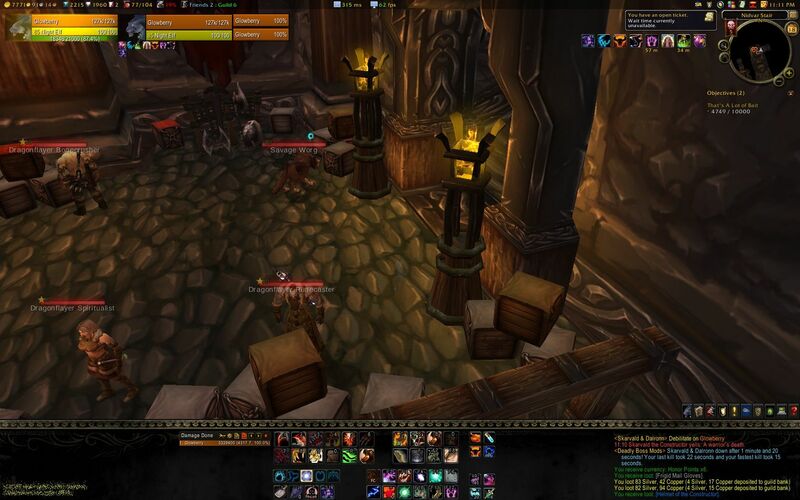 I was in my feral tank spec and gear; about 346 average ilvl. I chose to kill the first group of trash to get a feel for how hard they hit. I could have stealthed past them. You may be able to walk past them at 85, if you avoid the patrollers – I didn’t try it so I’m not sure. You cannot avoid the next two trash packs in any case – you need to kill them to open up the fire walls that block the next area. They didn’t hit very hard. I then just cleared down the centre of the drake room, and the next two packs after this into Keleseth’s room. The trash was easy and unrewarding. Because of this, I stealthed past the rest of the trash where I could. The dogs later in the instance detect stealth, but some I could walk past anyway, some I aggroed. Ok I failed on him. I tried 3 times, and the first attempt was the best one, as I resisted a couple of ice tombs. Basically, he ice tombs, and if there are skeletons up as well they beat me down with no recourse. I’d like to try again with some frost resistance and/or my pvp trinket to see if I can avoid being chain tombed. If I resisted two or three I’d be close to nailing him. These guys were easy, just tank and spank. I just burned down one then the other. Again, with no fancy mechanics, this guy was an easy kill. Ingvar, your pathetic failure shall serve as a warning. All in all I’m kind of disappointed and am calling this ‘not completed’ until I’ve downed Kelesth. Apart from resistances and trinketting, I’m not sure what else to try; anyone have any experiences soloing this guy? Armed with both my pvp trinket and resistance elixirs, I exacted my revenge upon Keleseth over the weekend. 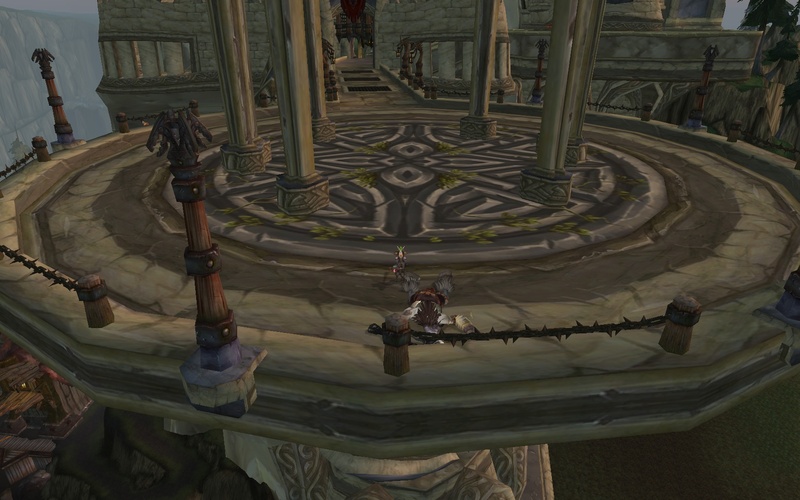 Utgarde Keep was mereely a setback. So now calling heroic Utgarde Keep ‘completed‘.